You are interested in European Studies? This section provides you with information about the background, the academic programme and the application procedure of our Master's programme. 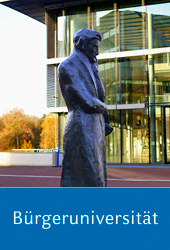 In addition, it includes information about Heinrich Heine University and the city of Düsseldorf. European Studies is an international Master's programme offered by Heinrich Heine University. The programme’s aim is to educate students on how the European Union works and how the EU managed to build a “working peace” in Europe after centuries of war. The Middle East needs more experts on European affairs because the EU is significantly intensifying its ties with the region in the course of the European Neighbourhood Policy. Studying and experiencing Europe’s "working peace" could contribute to the peace process in the Middle East. (see Application and admission), but has been especially designed for BA graduates from the Middle East who do a preparatory year in European Studies at their respective home universities. So far, our students did not only come from the Middle East, but also from Bulgaria, Georgia, Germany, Greece, Serbia and Spain. Before you decide to apply, please carefully read the special requirements for admission to this programme! how to study in Düsseldorf. Please send any question regarding application to Dr. Guido Quetsch, Executive Manager of the European Studies programme: quetsch(at)phil.uni-duesseldorf.de.